Stretching out across Stone and Taney counties in the southern part of the state of Missouri, Branson is one of the state's most popular resort destinations. It's a beautiful mountain retreat, nestled among the Ozark Mountains and offering stunning views in every direction and magical outdoor opportunities. Founded back in the 1880s, the town was named after Reuben Branson, who worked as the postmaster and general store owner back in the late 19th century. Branson is a relatively small and sleepy town in general; it covers just 20 square miles of land and is home to a little over 11,000 people, but attracts many more all through the year due to its prime location for exploring the Ozarks and its many live entertainment venues and theaters. The city is best known for one road in particular: 76 Country Boulevard. This street is filled with entertainment theaters like Dolly Parton's Stampede, ensuring that there's always something fun going on in Branson. Some of the city's other attractions include the Grand Country Music Hall, the Hollywood Wax Museum Branson, the Mount Pleasant Winery, Titanic Museum, Ripley's Odditorium, Silver Dollar City, and various zip lines, mini golf courses, cave tours, mountain hiking trails, and so much more. Branson is a prime place to visit on a road trip or RV ride around Missouri, and the area is home to a lot of high quality RV parks. 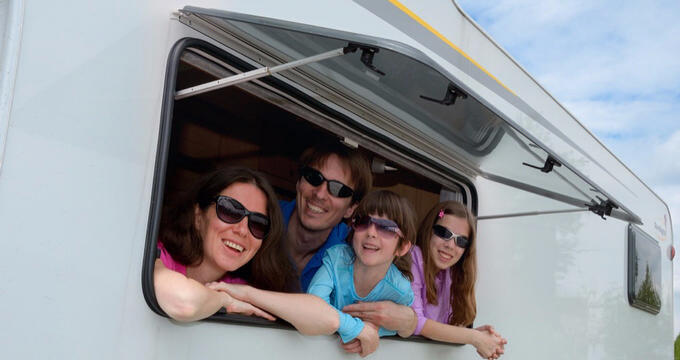 Read on for full details on the best RV parks in Branson, MO. One of the top rated RV parks in Branson, Branson Shenanigans RV Park is situated in a great area right by all the big shows and entertainment areas. It's only two blocks away from the 'Strip' of Branson, offering easy access to the city's attractions while still providing a calm, peaceful, cozy atmosphere for people of all ages to enjoy. You can spend a day exploring the city and catching a show or two before retreating the tranquil surroundings of Branson Shenanigans RV Park in the evenings. This site features full RV hook-ups with 30/50 amp power, water, and sewer, as well as high speed Wi-Fi and cable TV for an additional charge. Amenities at this site are relatively simple, with nice picnic tables, shady areas, a clubhouse, and impeccably maintained restrooms available for all guests. You can also speak to the friendly staff at this Branson RV park to get discounts and special offers on tickets for Branson's best shows like Baldknobbers Jamboree, the Grand Jubilee, and Dolly Parton's Stampede. If you're looking for a picturesque RV park in the Branson area, the City of Branson Lakeside RV could be the best option for you. As the name suggests, this RV park is located right by beautiful Lake Taneycomo, with many of the RV sites offering stunning views of the water and a great place to do some fishing. The huge Branson Landing area is right by this RV park, filled with over 100 stores, restaurants, and a unique water and music show for people of all ages to admire and appreciate. The RV park also offers good public transport links, with the Branson trolley running right outside and offering free service to both Branson Landing and the historic downtown district of the city. This is a pet-friendly RV park as well, so it's ideal for families with furry friends, and it also features some excellent amenities like two separate picnic pavilions, a dog park, toilets, restrooms, docks, showers, a laundry area, a clubhouse, and more. There are nearly 200 RV sites at this RV park too, so you never have to worry about the place being full. Warm welcome and lovely surroundings will be waiting to greet you at Oak Grove RV Park, one of the best reviewed RV parks in the Branson area. Located in a prime position for the various entertainment theaters and venues, this RV park offers easy access to the shows and landmarks that have made Branson famous, while also being relatively close to local green areas and lakes for outdoor recreation. This family friendly RV park is family owned and operated, giving it a nice, community-focused feel with friendly faces around every corner. The park is open all year long and features a good number of full hook-ups and pull-thrus. It also offers a dump station, high speed wireless internet, cable TV for all RVs, showers, restrooms, laundry machines, a meeting room, and more. The Strip is less than a mile away and there are some highly rated local attractions too like Stone Hill Winery, multiple outlet malls, hiking trails, and Table Rock Lake Dam.